Hay is all raked. Dry, ready to go. But the baler is giving me issues today. Spent a couple of hours looking at the manual ("Pictures show are a prototype. Your own unit may vary from this prototype". Argh!) trying to figure out whats causing the baler not to deploy the bale twine. And the windrows wait. And I have perfect weather. And the hay is dry. Hate you, baler. Truely hate you today. Want to be stacking bales now. Want to be baling. The loose-leaf manual I printed out gets caught by the wind and flys all over the pasture. Hate you baler. Hate you manual. Finally give up for the day. Really annoying. Tell the hay help to go home. Call the dealer for the baler. Guy will get here tommorow sometime. Check the weather. Weather ok. Have 3 more days of sun after tomorrow forecast. 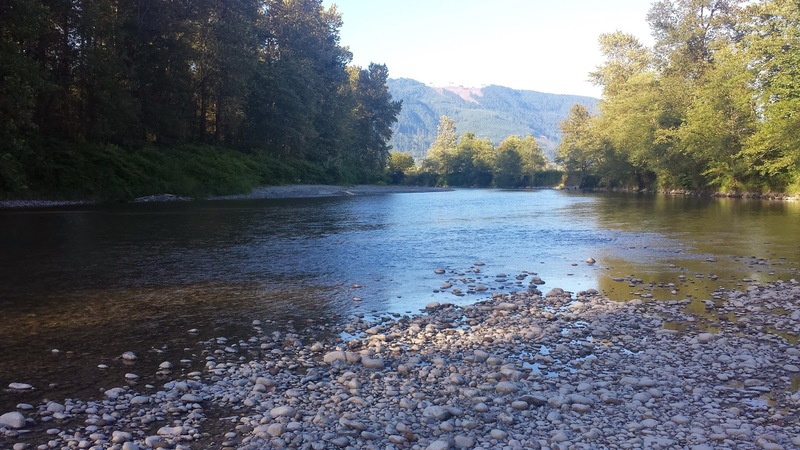 Walk down to the river. Look at the water. Air temp at 85 degrees. Been standing in the hayfield all day. Take a handful of water. Lovely. cool. Ok. Not so bad a day now. Hay looks beautiful. baling today. Looks like we're a go for baling today. I'll wait until the morning dew dries up, and then raking and baling. Looking forward to having it in the barn. Ok, you shouldn't do this. 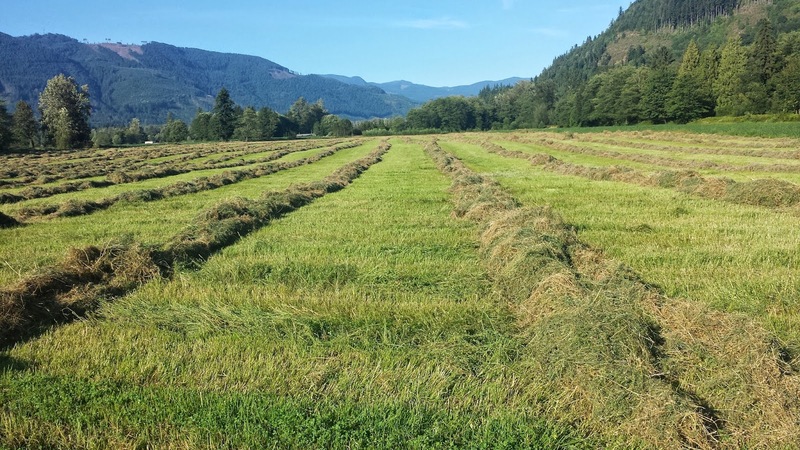 Don't drive your farm truck out over the newly-dried hay to service the tractor. 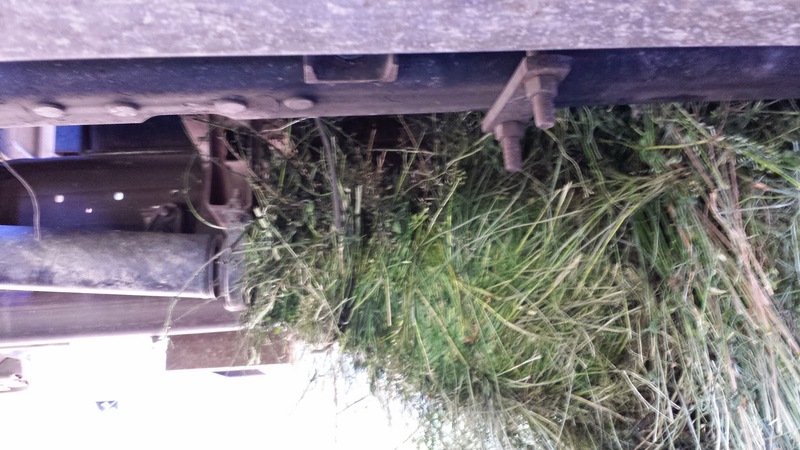 The hay was wrapped so tightly around the driveshaft that it stalled the truck out. 90lbs of hay painstakenly removed from the bottom of the truck. With a pocket knife. On my back. why would anyone grow an orchard of crab apples? 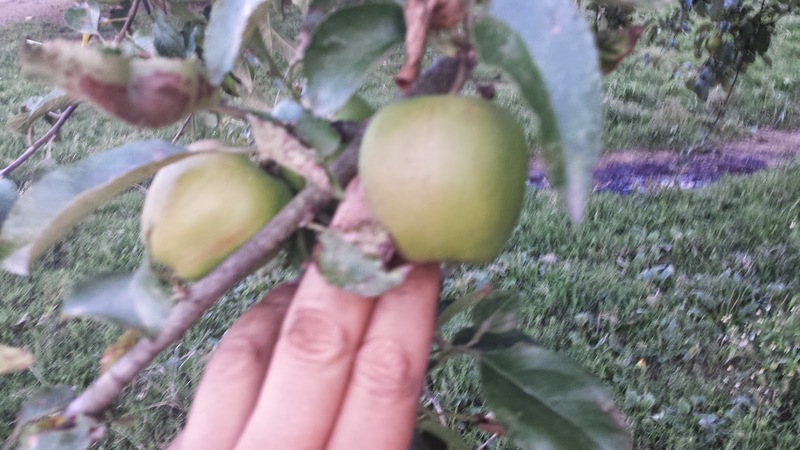 This farm has a fairly large, established orchard. The trees were planted on a grid system, and they've clearly been carefully pruned over the decades. This is my first exposure to an "old" apple orchard, and several of the apples here I just couldn't understand. 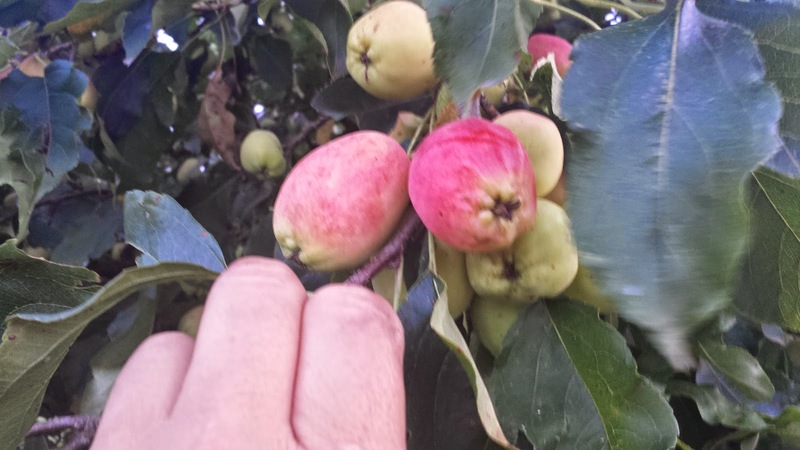 I took a WSU extension course in hard cider production, and learned that the off-tasting (and smaller) apples are often used as a flavor agent in batches of hard cider, and in fact, could make very tasty cider when mixed with juice from other varieties. If you're interested in what WSU has to say about cider, you'll find it here. Hard cider is a traditional way to preserve the bounty of an orchard into the winter months, and was in fact a very popular drink in early America. What I'll do is press each trees output separate, ferment them separately and then mix them to produce the final product, for bottling. Which is what the WSU course suggested. 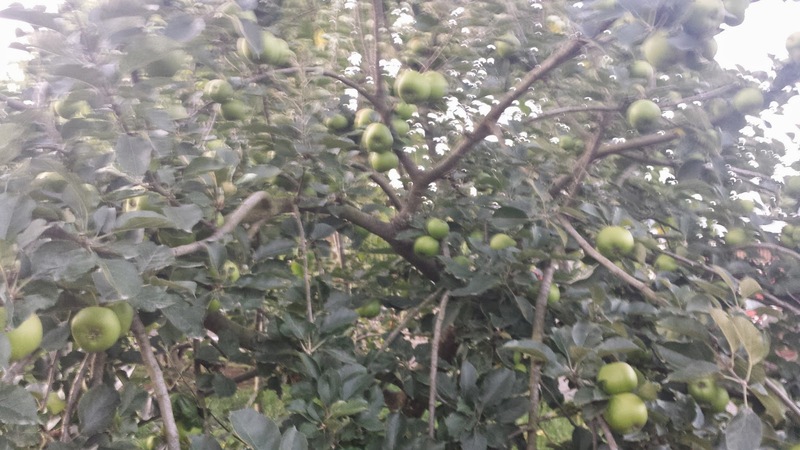 Most of the apples I have here are probably cider apples. 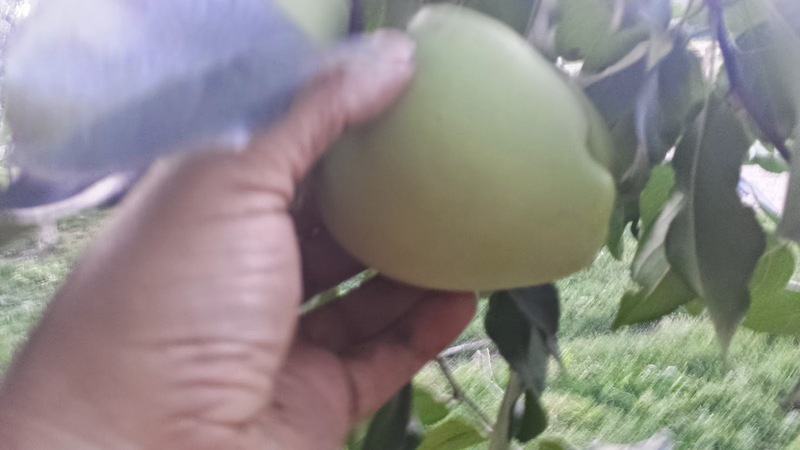 I do have a couple of trees of dessert apples, which is what most folks think of when they think of apples. But each variety has a place, and I'm interested in experimenting with these older apples to see what they produce. The next four or five days will be very busy. We'll be cutting and tedding and then baling hay in the window we've got. Forecast shows temperatures in the 80s for the next few days, which around here is HOT. 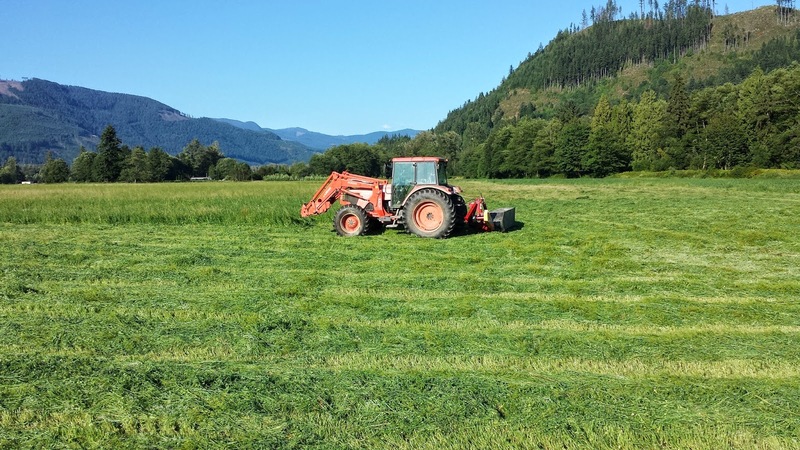 From what I've read, cutting the hay in the morning results in the best-quality feed (nutrients go from the roots to the leaves and then return at night, so you're catching the plants at the best time). My cutter is pretty fast, but my rake is pretty small -- 10' haybob -- so I'll probably get a better rake this winter. The corn is doing well; color is good, soil appears to be supporting the crop. Now it's just a waiting game to see if it gets ripe enough before the end of the year. Crossing my fingers. a few weeds yet. I'm going to see what I can do to get a spring harrow to clean those up next year. This year we'll see how it goes. I've had a couple of boundary disputes about my land, (with the local parks department and with a neighbor) and both were basically solved when we looked at a professional surveyors survey of the lines. But it's only recently that we have surveyors, the last hundred or so years, and for thousands of years before that people have been interested in the boundaries of their land. One system that I'm familiar with is the english system of metes-and-bounds, or beating the bounds. This basically consisted of getting together a group of the local inhabitants and they would walk around the village and recite who owned what, and the landmarks related to it. At the time, english fields were managed as long strips of land -- furlongs. An english field of the time would consist of long furrows, each one owned by one or many other individuals. This is different than our modern system of mostly-rectangular lots, and there's pretty good records that there was a lot of conflict about this organization. it was pretty easy to harvest the furrow next to you, and /or to overrrun it when you were putting in your own crops. We know this because one of the best set of records that survive from this time are the court records, and they're a long list of small fines for crop-related incidents. Plant too many seeds in a single hole? Yes, that actually was an offense you could get a fine for, and the court records show that. Most of those fines were for people who were planting crops for others -- a peasant planting the lords share of the land, for instance -- but there are thousands of references to disagreements about rows and ownership. These long rows resulted from the technology of the day -- ox-drawn plows. It was difficult to turn the oxen and plows around to plow in the other direction, so rows were made as long, and as straight, as possible. The people of the time did keep cattle, but the main reason that they kept them was for tillage or transport - plowing their fields or pulling their carts. Meadows were prized as a source of forage for the oxen, and the oxen were often required to be kept in the lords barn over the winter months. That wasn't generosity on the lords part - the lord got to keep the manure from the oxen, which was applied to the lords fields and improved their harvest. It was, in effect, a manure tax. The beating the bounds relied on the community memory to resolve property disputes, and this system still remains in place today in our legal system. Concepts of adverse possession, for instance, were ways to resolve issues when someone else had used land that they didn't own for a period of time - it was a solution to the problem of constantly shifting boundaries, or the deterioration of landmarks or other markers for boundaries. "knee high by the fourth of july" - not my corn! After the custom-planting disaster earlier this year, my corn crop is late, but growing well. This is an organic seed and being raised using organic techniques -- no herbicides, not pesticides, sunlight, soil, manure, rain. 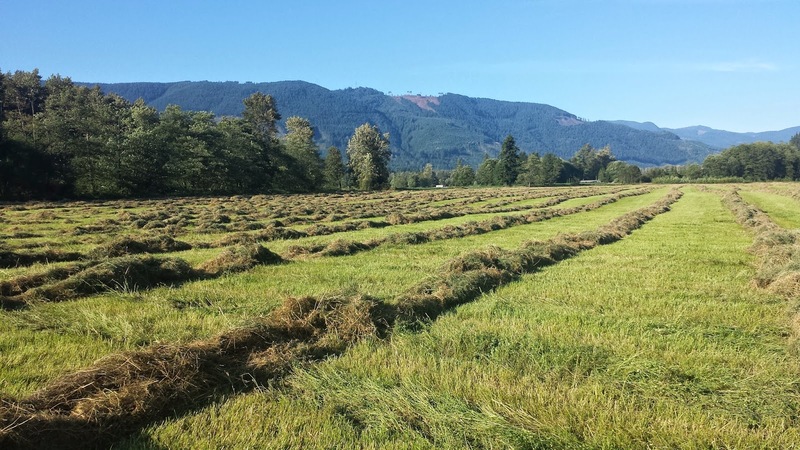 The goal of this crop is to provide high-quality winter feed for dairy cows. The challenge last year for the corn that I raised was that the weeds got away with the crop; this hasn't really been a problem with this corn so far. there's a few weeds, but at this point it's clear that the corn is ahead of them, and they probably won't matter much. Below you'll find two picture-pairs, taken two weeks apart. 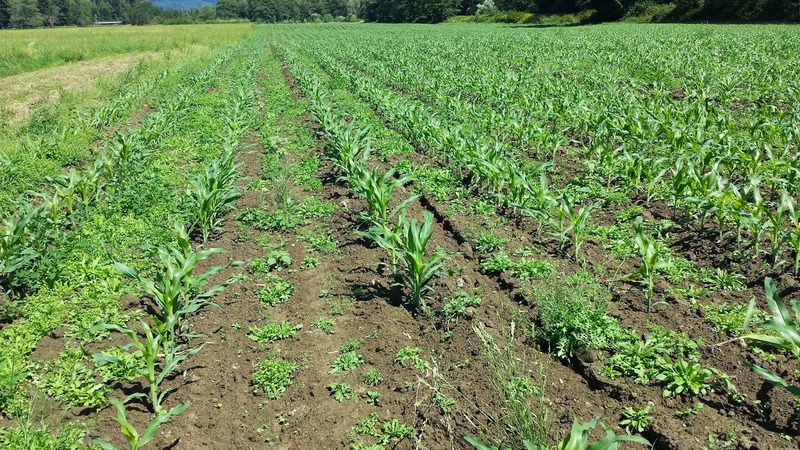 There are a few weeds here and there, but the corn grows very fast and will shade out the majority of them. I'll watch the growth and see if I need to plan on some sort of cultivation schedule, but so far so good. Looking at the corn plants, it's clear that one of the corn planters isn't working correctly; there are gaps and bunchs of corn in about 25% of the rows. I think I know which one it is (I started planting going in one direction, and one of these rows isn't very good) so I know where to start on the fix. This corn is planted on ground that had corn on it last year. I did put out water from the manure lagoon, but I have to say I'm pretty curious how the corn will do. This is cow corn -- the intention is to grow it and then chop it up and ensile it. This is about 10 acres total; I'm expecting something like 200 tons of this corn silage this year. The alfalfa I planted earlier this year is now 24-30" tall, and is at the "1/10 bloom" stage of its growth. 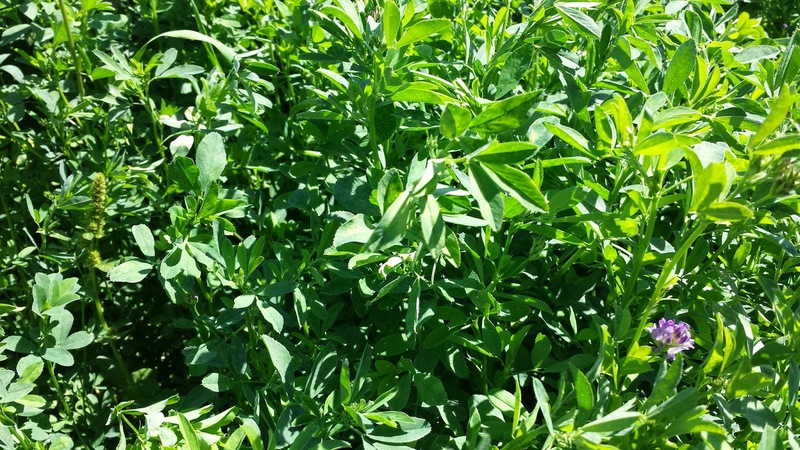 That's a new term that I learned from this publication from Kansas State University, that talks about when to cut alfalfa and what the different growth stages mean. This is my 2nd attempt at growing alfalfa, and this one is going pretty well. The plants look good, no sign of any issues at all. And they're thick enough that they've crowded out most of the weeds. There are still some weeds, but I suspect that once this is hayed that the alfafa will drown out any remaining weeds. Part of my cutting at this stage is motivated by a weather window, and part by a desire to cut the weeds down before they go to seed, to cut down on the number of weed seeds available for the future. This stand is organic; no herbicides, no pesticides. Sunlight, soil, manure, rain are the ingredients. I am noticing some differences in overall fertility in various parts of the field. I'll take some samples from those areas and make a note of the results for next year. 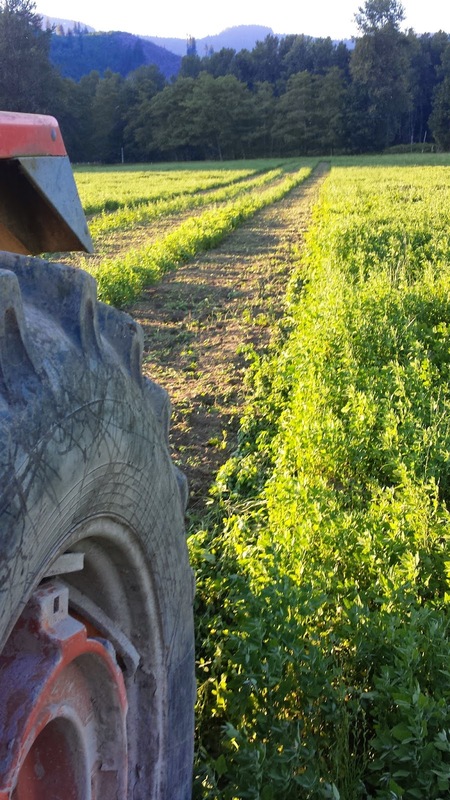 Generally speaking though, I'm happy with the growth and I think this will make fine alfalfa hay. One thing I noticed when I was mowing this, was that I could feel the wheel ruts from planting. I plowed and then disked, and then seeded the ground, and the seeding step depressed the soil under the tractor tires. So the ground is subtly corrugated. This is a bit of a problem -- the cutter can handle 6-7 miles an hour, but the washboard effect from the planting tire tracks makes it a rough ride. So next time I'll make sure that the ground is as flat as I can make it. It's fine as hay ground, but smoother would allow me to work faster now. 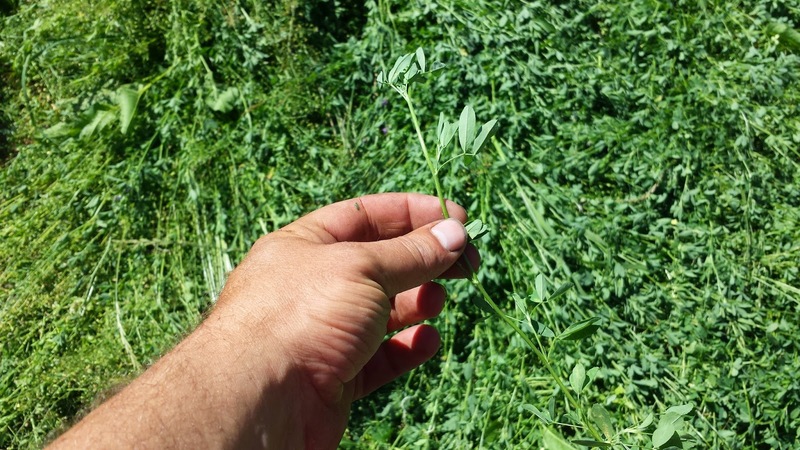 The alfalfa grass isn't as luxuriant a grow as the pure alfalfa. 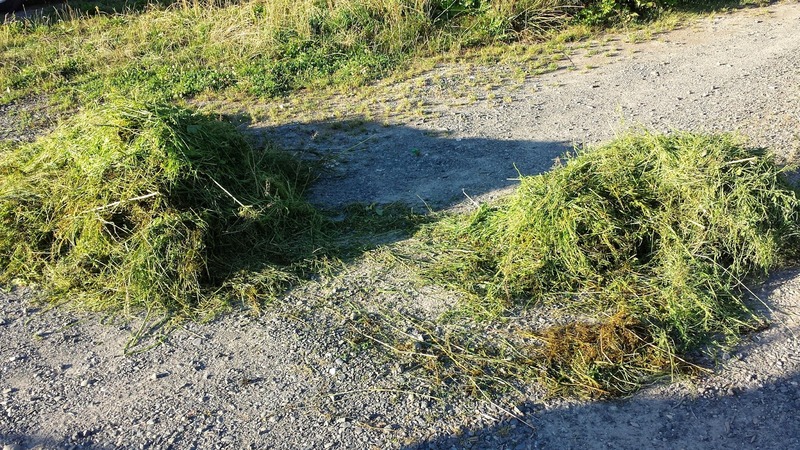 The hope was that by adding grass to the mix that it would help the alfalfa by competing with weeds, and in the final bale, the grass would provide more fiber in addition to the nutrition from the alfalfa. 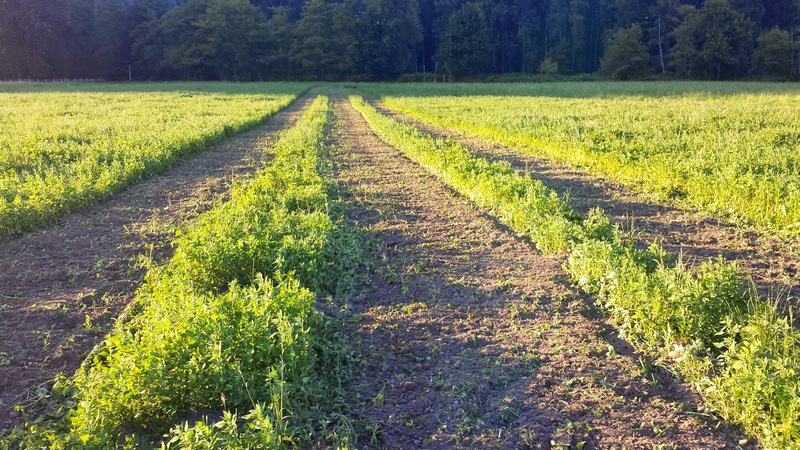 In this area, planted within a day of the pure alfalfa, the stems are 2-4" shorter. It'll make good hay still... but I don't notice a difference in the number, type or quantity of weeds. It's a bit cheaper seed mix though; grass seed is about 50% the cost of alfalfa seed, so I figure I saved $40 or so an acre. Duly noted. This is a multi-year experiment. I'm going to allow a portion of each test area go to full bloom before harvesting - that means that the root system is very well developed. I'm going to look at the winter survival and next years growth to see if there's any difference between that and stands that I harvested at 1/10th or 25% bloom. So I like the look of this crop, but how good is good? Only way to tell is to have it tested, and that's on the list. For me, it gives me some feedback on how well the crop will serve in its intended purpose -- premium feed for dairy cows -- and it'll make it easier to sell to horse people. 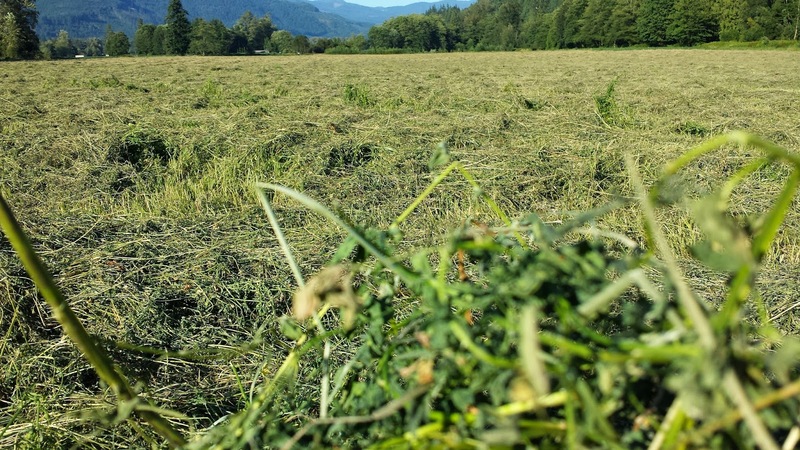 The grass and alfalfa should produce something like 2 tons per acre across a couple of cuttings. That means that I'll probably end up with somewhere north of 100 tons of hay. The problem around here isn't growth - we have good soil and good growth. 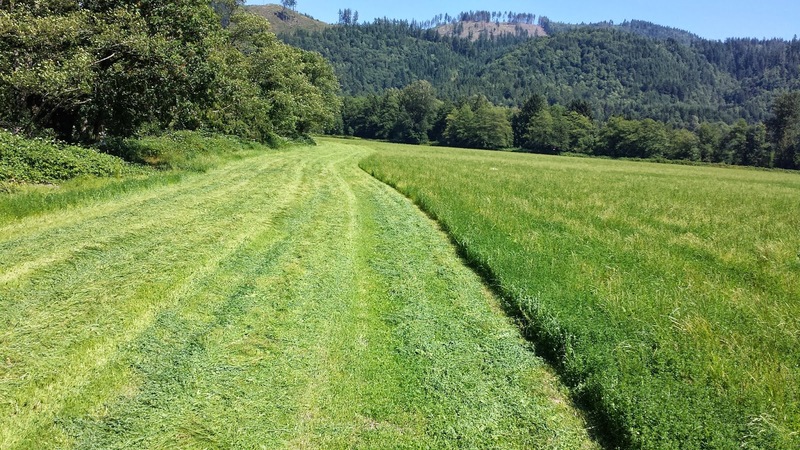 The problem is haying weather. I'm going to bale this in small square bales this year, somewhere between 60 and 80lbs per bale, so somewhere between 2500 and 3000 bales total. In this area alfalfa sells for $20 per 80lb bale, retail. If I can make my bales look like the eastern washington hay I think that they'll sell well. And I don't have transport costs, so the margin will be a bit better. It's my intention to bale and stack this hay starting friday morning, and hopefully have it in the barn that evening. For this first baling I've only cut 6 acres. 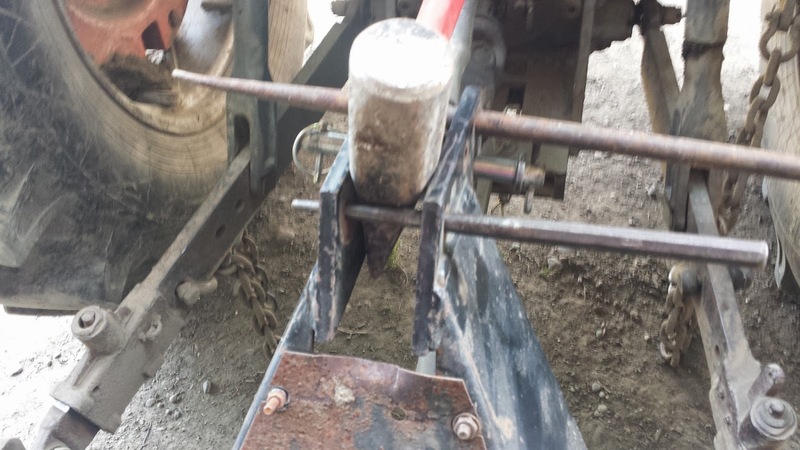 The biggest problem that this rototiller has is that the three point hitch is bolted on, and not welded. And in this case, whomever did the initial assembly didn't use the right sized bolts for 4 of the 8 bolts. 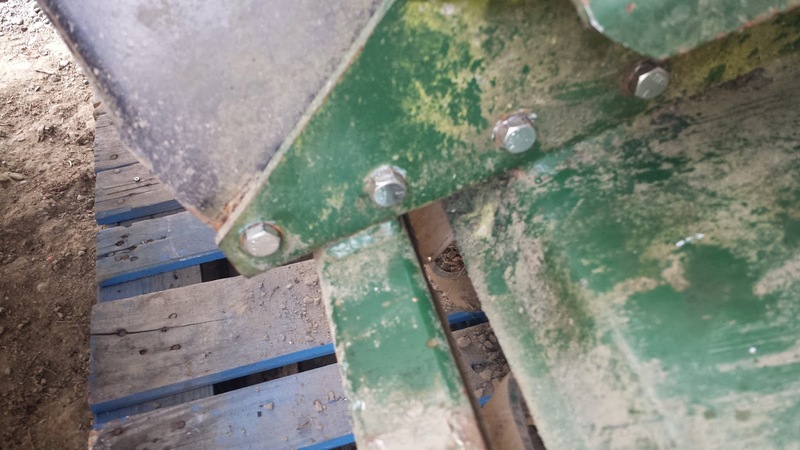 Since it was loose, all of the bolts were damaged by shaking. 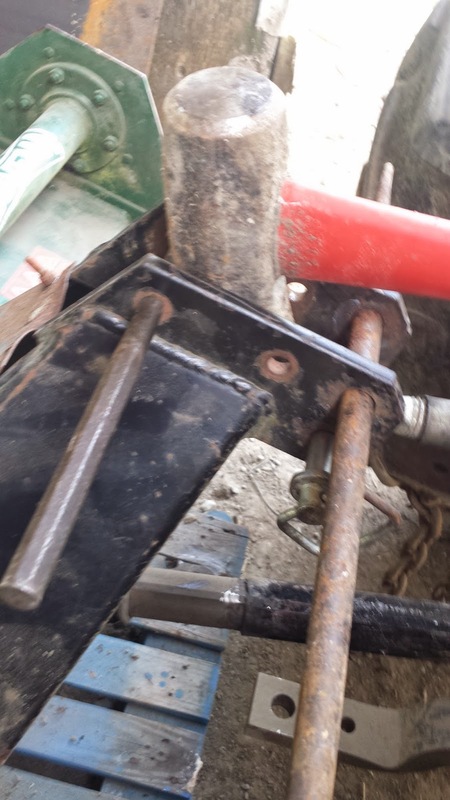 The attachment points were also a little bent, and so the maul was used to provide the right spacing and the rods to provide alignment, and a couple of straps were welded on to tie it all together as aligned. The errant bolts were found, removed, and the right sized bolts and lock washers installed. I used to use equipment, and then make a note to myself "gosh, I should fix the three point on that rototiller". What always happened is that i'd forget about it until I needed the implement again, and I'd go to find it broken. 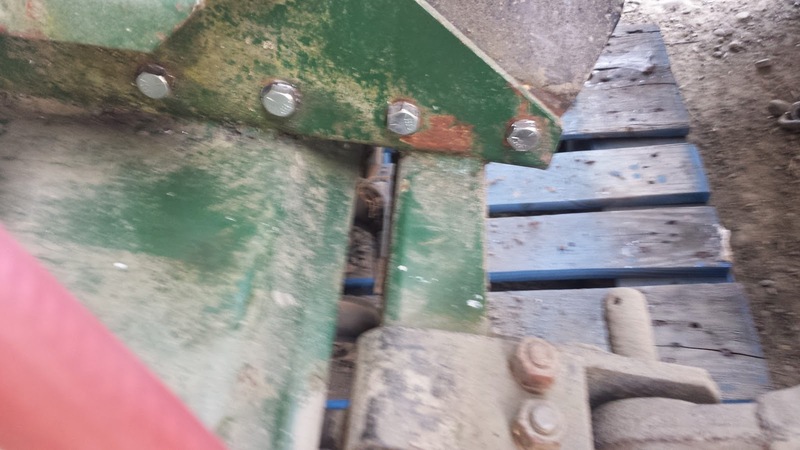 So what I do now is to make sure that before I park the implement it's in good working order in all respects; what's wrong with it is fresh and I can get to it relatively easily instead of trying to recall what the issue was 6 months or a year ago. Particularly for implements that you only use once a year or for a portion of a season and they sit there for the rest of the year. With this implement; check the oil level in the transmission, grease it, make sure that the parts are in good working order and pressure wash it is the routine before parking it for the year. The pressure washing isn't really neccessary... but it is if you want to inspect the equipment. Particularly things like plows and rototillers -- stuff can get hidden under the dirt and you won't know about that crack or defect until the thing breaks. Better to catch it early. The repairs on this particular tiller cost about $30; a little bit of flat stock, 8 bolts and washers and nuts, about 20 minutes of time. And it's good to go for another year. One thing aobut this land is that it's really, really fertile. If I let it go I get a lush green crop of...something. But something is not what I'm after, so out comes the rototiller and I make pass after pass between the pumpkin plants. I have a pretty narrow window to do this in -- once they start to vine out they'll be all over the rows and between them, so nows the time. Voila! 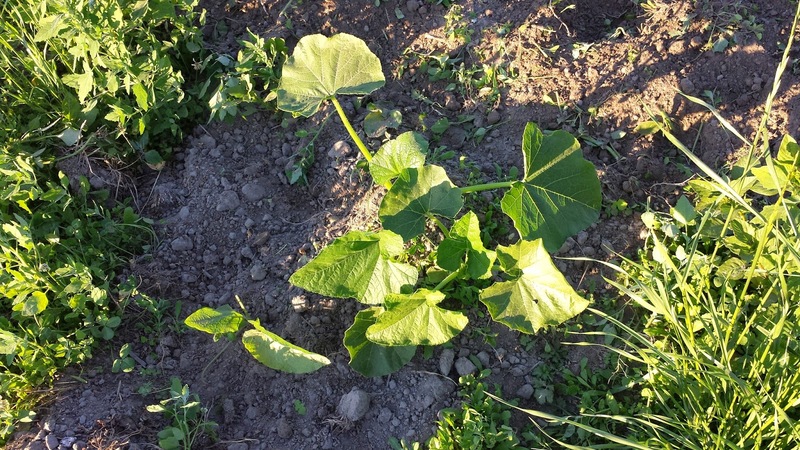 The pumpkin plant emerges. There's got to be a better way, probably some implement that does this, but this year it's old school. A couple of hours a week seems to be keeping up with it. 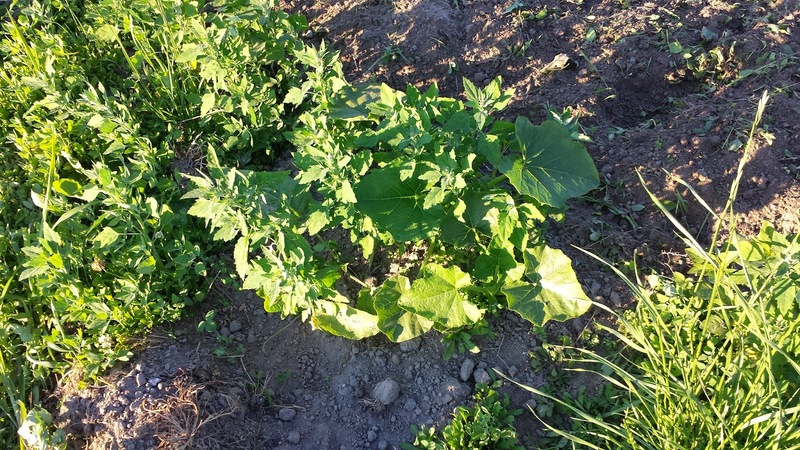 I'm knocking the weeds down between the rows both to put the organic material into the soil -- composting them in place -- and to prevent them from getting to seed stage. I'll keep running the tiller over those stripes every few weeks to take out more of the seed bank, and hopefully by removing millions of seeds after they sprout make it easier to deal with next year. I do notice a real difference between the areas that were treated with roundup last year and those that weren't. Much more green and lush and growing in the non-herbicided areas. 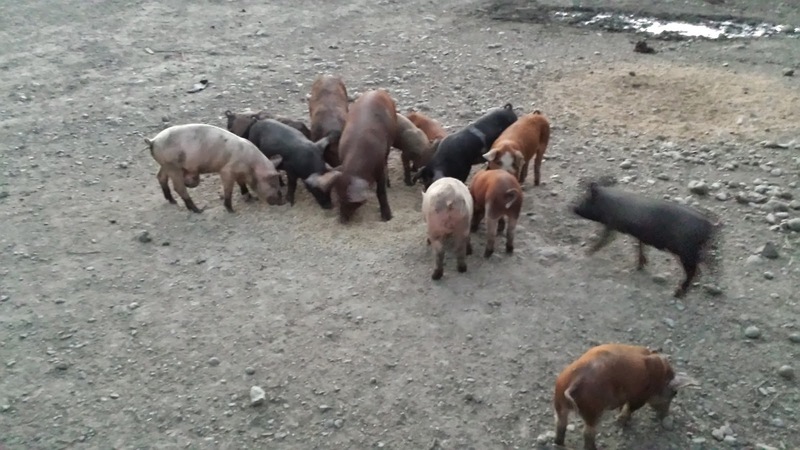 Bunch of piglets vacuuming up the spilled feed. 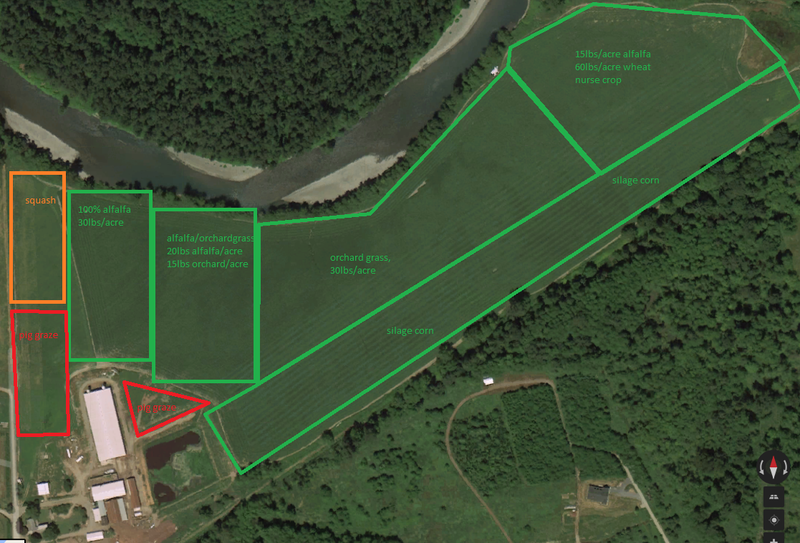 We operate a small diversified farm. Our primary product is pigs, but we raise a little bit of everything. We're looking for someone who loves working with animals, has basic carpentry skills, can lift 60 lbs, has a clean driving record and a good work ethic. We would prefer someone who's willing to commit to 1 year; this is not a summer job. This is NOT an internship. We pay a fair wage for a fair days work. You'll learn, but we'll pay you to do it. We don't think anyone should work for free. We will pay you less during an evaluation period. If you work out, we'll pay you more. We figure that's fair. We do work with animals every day; some of the animals will appreciate you. Some will bite you. You have to love them all. Common tasks include fence construction and repair; animal handling and movement, cleaning and repairing animal enclosures, pens and shelters, picking up supplies for the farm, SHOVELING CRAP. MOUNTAINS OF CRAP. Tending to crops in various ways. You'll be lifting, stacking, hammering and chasing every hour you work. This isn't Farmville. It's not virtual. This list is not a complete description. Did I mention the crap? We do raise animals for people to eat. We'd prefer it if you didn't faint at the sight of blood. Yes, you will see blood if you work here. Some of it may be yours if you're not careful. We want you to be careful. No experience necessary, but if you are a nitwit, just cross us off your list, ok? What's the least amount of land that will support a family of 4? 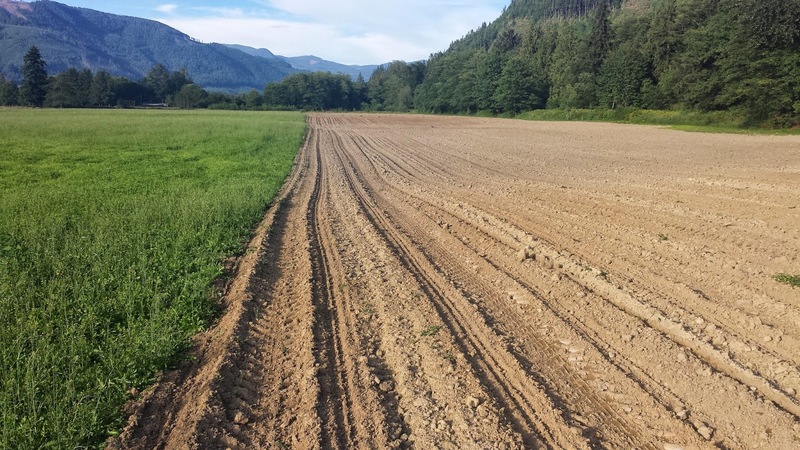 "How much cropland and stock animals required for US family to sustain itself?" And while that's an interesting question, it's pretty big. 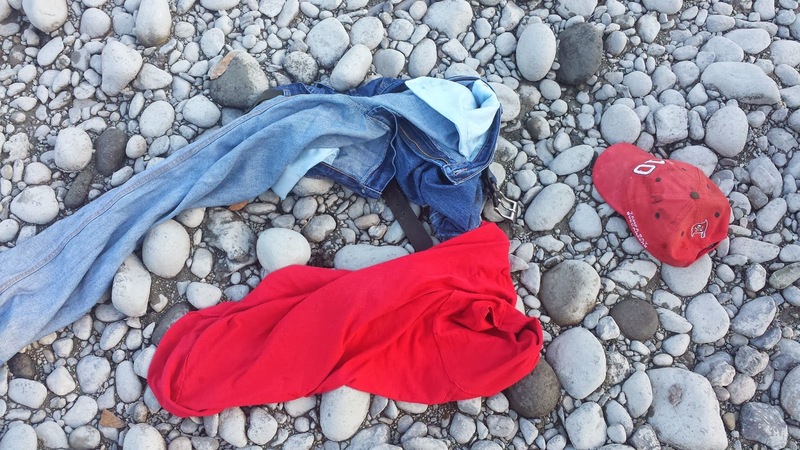 Like, how do you account for the cotton in the clothes you wear, or the leather in your shoes, or the rare earths in your cell phone, or any of the million other inputs we all have in our modern life. The fact is, the typical american requires this entire planet to live like we do. What's the smallest area of land that can provide food for a family of 4? The first thing to do is figure out how much food we need. For most folks, a 2000 calorie diet is good; kids eat a little less, adults a little more. Modern corn varieties yield 2.47 tons per acre; you'd need about 450 pounds of corn per person per year... so your family would need about 1800 pounds of corn. I'm going to round that up to 2000lbs to account for wastage and rodents. Now what kind of life would that be? Well.. it's actually how quite a few people in africa live right now. When I was traveling in Zambia and Zimbabwe in the mid-90s I ran across quite a few tiny farms that had their corn patch, and the primary, staple food was a corn meal mush Zambians call nsima, and Zims called sadza. It was present at every meal, and was the bulk of the calories eaten. Most of the time the primary goal of most of the farmers was to get something to flavor it with -- a bit of dried fish, or chicken, or some bush meat. 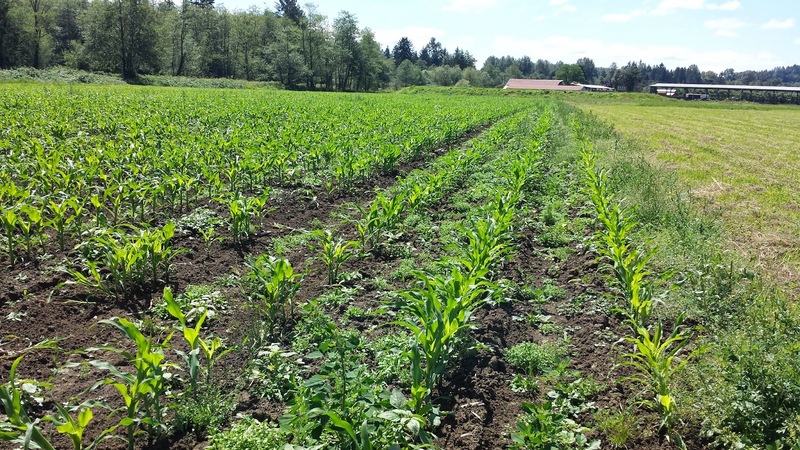 I mention that here because it's entirely possible that your family of four could really, honestly live entirely on the corn produced on a 3/4 acre parcel. Catch the occasional squirrel or rat or bird for flavoring, and you're all set. Salt helps, of course. Everything is better with salt, but in a pinch, having your stomach full is a big plus and if it's a bit bland... well, you're not hungry. I read variations of this question all the time on homesteading forums; and you get answers all over the boards. Sometimes it's 2 acres, or 5, or 20, or 50... some solutions have permanent wood lots for supply heating wood, some include animals, some don't. What's interesting on this is that most of the people start with the basic assumption that you're going to be able to supply from your own patch of land what we take for granted in our average local supermarket. Sorry to say, it's not going to happen. Subsistence lifestyles, which is the basic question posed, often mean that you have one staple crop. rice, corn, potatoes, wheat. And the bulk of your time and energy is spent growing that single crop. If you manage to make enough to feed your family, then you can think about adding something to that staple crop to make it taste better. Like salt. Now if you're able to produce a surplus consistently, then you start thinking about things that you don't normally eat. Like sugar. Or spices. Or Butter... yes, butter is a luxury. Think about what you have to do to produce a pound of butter. 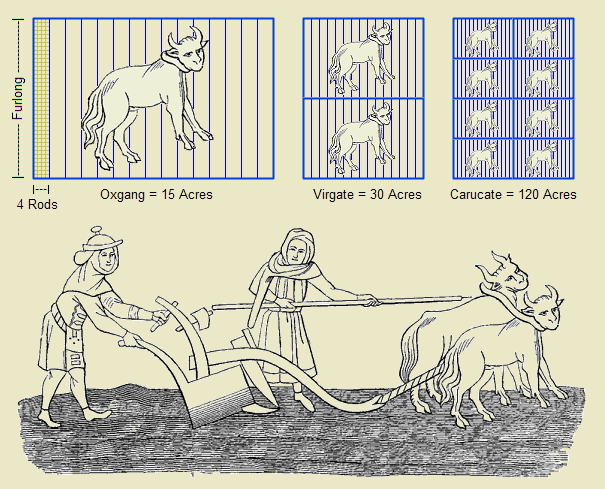 In the dark ages people did keep cows, oxen, but the primary use of the oxen was for drawing carts and plowing. Oxen were very hard to keep; pastures, meadows, places where hay could be cut and stored, were precious, and claimed, and you had to be pretty wealthy to own enough land to be able to support an ox, or a team of oxen. You didn't keep them for milk, as we do now. You kept them as your tractor. And if you got some milk, that was a bonus. But not the main purpose. 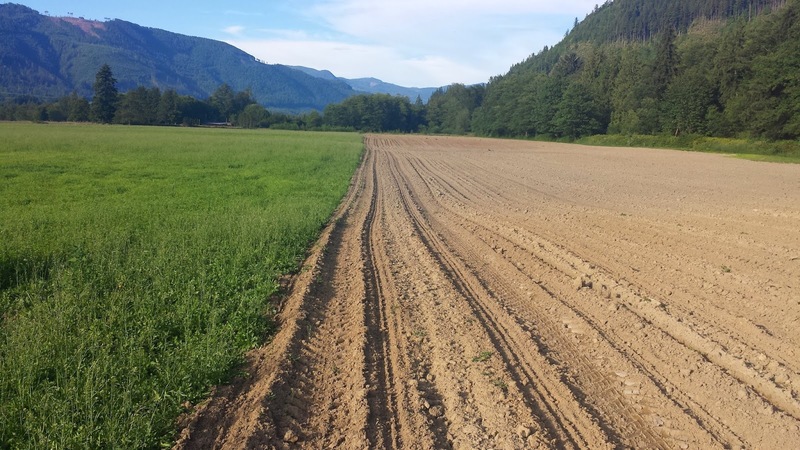 So if we're talking about a subsistence lifestyle, you're going to be focused on your crop. And for corn, that means you're out there with a bucket watering it. And a cane chasing off the deer. And with your hands picking the bugs off it. Because corn (or wheat, or potatoes, or rice) IS your life. Without it you'll cease to exist. Keeps you pretty focused. 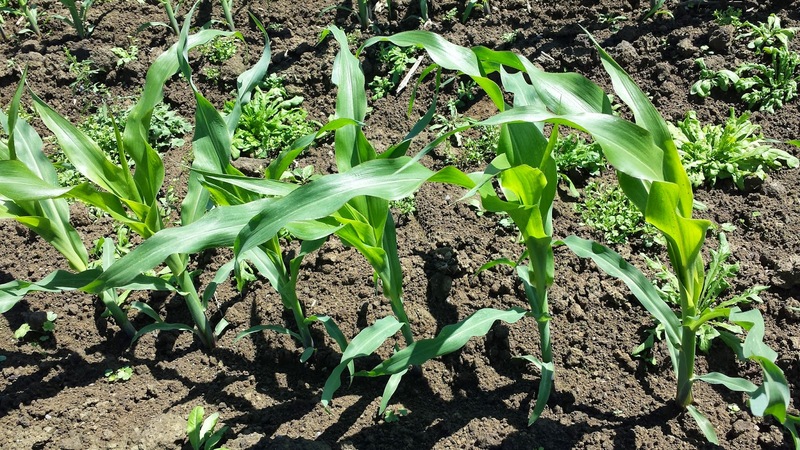 And planting corn becomes pretty important because corn doesn't really keep very well; it's not like wheat that can go for thousands of years and still sprout. So every year you have to have a good harvest, and you have to put enough of that away that you can replant. And when you plant corn becomes really important. If you plant it too early, it may die. 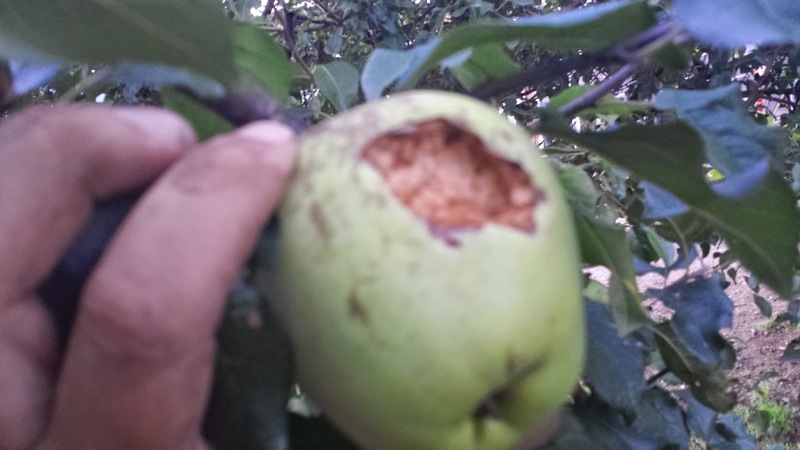 If you plant it too late, it may not ripen. And if it's not ripe at harvest, you have nothing to plant. And you start seeing why all of the ancient corn civilizations got really, really good at astronomy. They used the stars to tell them the seasons, and when to plant, and how long they had. The weather wasn't reliable enough, but the stars were. And you can see exactly why they had to know. They would cease to exist if they made the wrong decision in any given year. Huge pressure. The early contacts in the americas between european settlers and native tribes ended with reports from them that each tribe that grew corn would usually have a 3 year supply of it in their village. If the crop didn't work out this year, they'd just dip into the surplus. This sort of "sloth" on the part of the tribes struck the early settlers wrong, and there are many accounts of attacks on the indians storehouses to destroy the surplus, to get the indians to work harder. But there's a reason for a reserve. Right now, our society uses virtually all of the corn we produce every year, for one thing or another. Ethanol, animal feed, raw material for various products, and food for humans. So we do have a surplus in a sense -- if our corn supply falls below some level, there are things we can reduce to provide more food for humans. But when you look at it on a global scale, we don't have anything like a 3 year supply of food. I've heard it said that we've got on average, a 3 day food supply in every city in america. So we're three days from a subsistence lifestyle. Do you own a hoe? 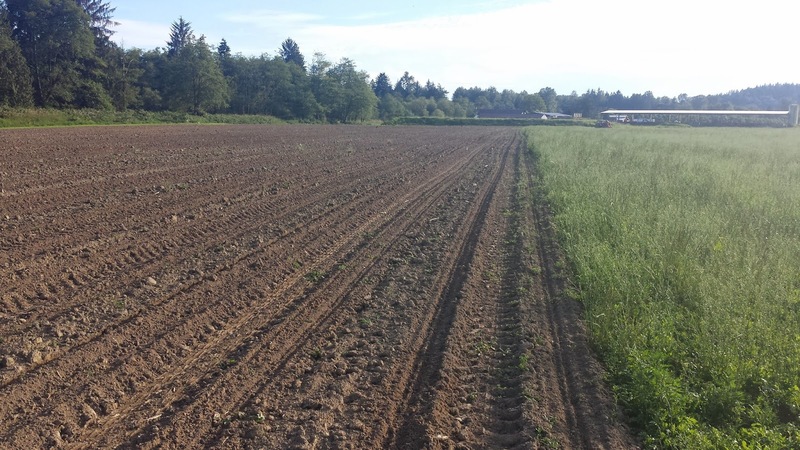 I had my crop layout all set earlier this year; I'd read up, purchased my seeds and a seeder, and worked pretty hard to get the ground ready. 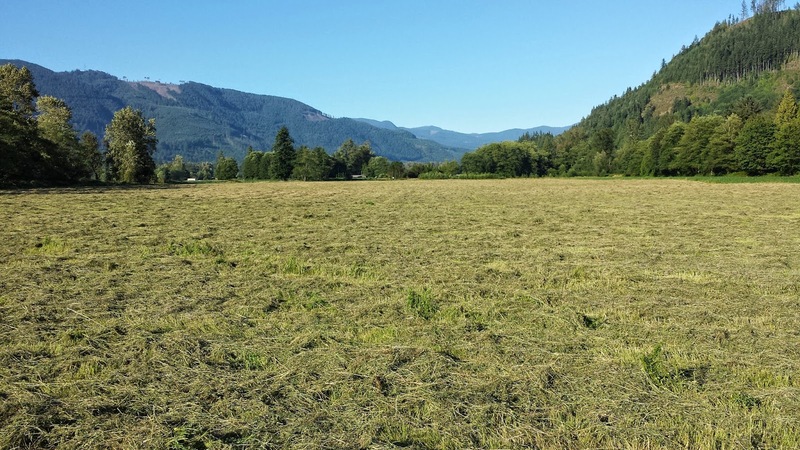 It took most of two weeks, but with the alfalfa and grass and squash and pigforage areas, I was pretty happy. I don't mention the corn area because I'd talked to a local guy who grows a lot of corn in this area last winter, and I'd arranged to have him come out and plant my test plot of corn. 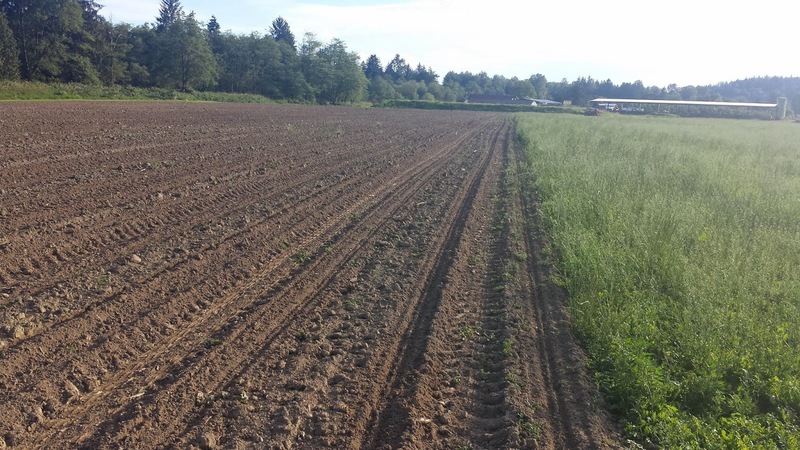 The idea was to plant it and start practicing growing organic corn with tillage vs herbicide. You can read all you want, but there comes a time when you want boots on the ground, and hands in the soil and to see what works and what doesn't. So around the 1st of May (which is the start of corn-planting season around here) I called this guy, who I'll call Albert (not his real name) and asked when he'd be out. Actually, I texted him, and he texted me back, and said he was down the valley, and he'd be up my way soon. So I waited a week, 2nd week of May, and texted him again; "I'll be up there soon". Now when I said "I waited a week"... I wasn't really waiting. Stuff would germinate, rain would cake the soil, and I'd have to go over the field again to get rid of the weeds and fluff the soil back up... again. and again. and again. This is getting annoying. But it's also giving me time in the saddle with the tillage tools and by the time I've covered this field 7 times, I'm also getting to know what the ground is like. What's clay, and whats sand, and whats dry and drains and what's wet. So the first week of june rolls around, and I text him. "The weather is unpredictable", he says. Screw you, albert! you planted the 40 acres RIGHT NEXT TO ME. Look, if you told me you didn't want to plant my small plot I would have made other plans. If you'd said you would plant it, and you'd crossed the fence from the other field to plant mine... great. Job done. I pay you, we both win. But this is the WORST thing you can do to me; shine me on and tell me you're coming for a MONTH and then you're just gone. Albert did tell me about a guy who had a planter, and I did go and buy that planter, and then I spent a week or so waiting for parts to come in and fixing it... and so 3rd week of june my corn went in. a good 3 weeks after everyone elses corn. Planting isn't like other stuff. If you miss a window you're done for the year, or that's the way it feels like to me. For the last month I've been watching other folks corn plants come up, and really, really being annoyed at YOU, ALBERT. I didn't have a corn planter on my list this year, I thought I had it taken care of, but next year I don't have to wait for someone else; I've got the tillage tools and planter now, and I'm on my own schedule. So my cows got out last week, and they ran over to a field of corn that Albert had planted, and they trampled a bit, and ate some. I got the call, and went over, and there was Albert and his whole crew, maybe 6 guys, and he's pretty annoyed. And I thought about calling him out on the planting thing, but I figured my cows had gotten my revenge, and didn't. Look, if you tell someone you're gonna do it, then absolutely do it. Don't shine them on and then flake out weeks or months later. Particularly with PLANTING. ALBERT. I chose a 71 day corn variety, and I think I'll get good enough weather to get it to harvest, but my real hope was to compare my corn with Alberts corn across the fence. But that's a little messed up right now; I'm 3 weeks back. So even if I wanted Albert to come back and chop it for me it won't be close to his corn. And I'll be darned if I'll contract with Albert to do any other work for me. Fool me once, shame on you. Fool me twice, shame on me. You don't get a 2nd time Albert.